New Witsies introduced to the university’s sporting culture with the Pride All Star Game. First-year Witsies were treated to some exceptional football as Wits Football Club thrashed a weakened Bidvest Wits side by four goals to nil at the Bidvest Stadium on Wednesday, January 30, in the Wits Pride All Star Game. The Educated Footballers were in full strength in front of an eager Wits crowd, predominantly of first years, which was treated to performances from musicians, Busiswa and ZuluMkhatini, under the scorching midday sun. On the opposite side was a weakened Clever Boys side, comprised of players from MultiChoice Diski Challenge side, who never quite settled into the friendly encounter. Wits Football took an early lead with a Mahle Mtabane goal before captain Tshireletso Motsogi doubled the score with a headed goal from a well-delivered corner just before the break. The second half started in similar fashion with Kurt Pienaar punishing a sloppy Bidvest defence after latching onto a through-ball and rounding the keeper before slotting the ball away to make it three. The victory was sealed when Clinton Mphahlele beat two defenders and finessed the ball into the corner to the enjoyment of first-year Witsies who were evidently supporting the university side. Motsogi was disappointed to not be playing in this year’s Varsity Football tournament after losing to the Tshwane University of Technology in last years’ final and failing to qualify in the University Sports South Africa (USSA) tournament last year but believed this season would allow the team to rebuild. “Varsity football is one of the biggest tournaments for us so missing out on it takes a huge toll on us. But we have to keep pushing and hope that we win USSA the make it through. Daniel Badenhorst, a first-year BEng student, who was watching both teams live for the first time said that the encounter was a great way to show the first years about football at the university. 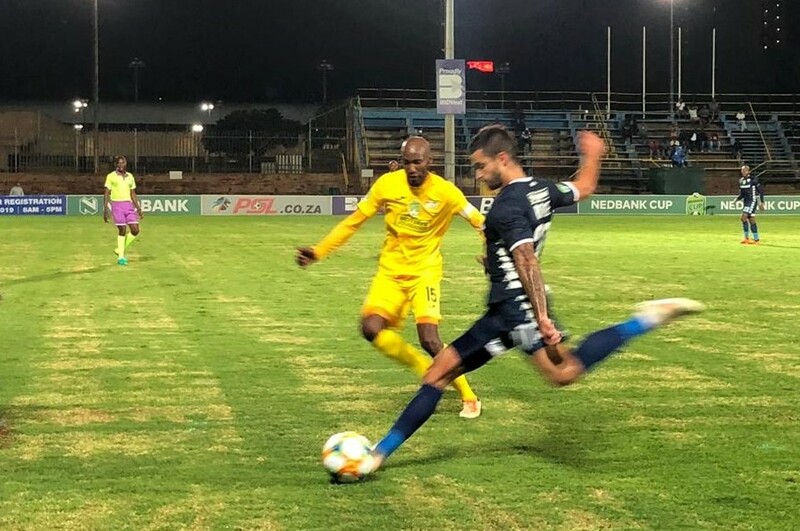 Bidvest Wits secured their spot in the Last 16 after beating the amateur Boyne Tigers 4-0 in the Nedbank Cup’s Last 32 match at Bidvest stadium on the evening. Relentless showers of rain and slippery grass presented no challenge to Wits’ Haashim Domingo who scored the team’s first goal in the 11th minute. Less than ten minutes later, Scottish striker Simon Murray dribbled past the Tigers and passed the ball to Domingo who secured the second goal. The unmerciful Clever Boys gave the timid Tigers a tough time on the pitch by dominating their weak defence. Murray scored the third goal in the 20th minute. The fourth goal was bagged by Murray again in the 38th minute. The striker was happy to have contributed to all four goals in the match. “You never know with an unknown team what you’re gonna get but it’s nice to contribute all four goals for the team. We got into the next round and hopefully we can make it to the finals”, he said to Wits Vuvuzela. The Tigers returned with force in the second half trying to secure a goal, but were not successful, in spite of Bidvest not scoring any more goals in the second half. Bidvest Wits coach Gavin Hunt told Wits Vuvuzela that he was impressed with the Boys’ performance. “The performance was good and we in the 16. We’ll see how far we can go and take it from there. We obviously expect to win the Nedbank Cup,” he said. Bidvest Wits will be going head-to-head against Maritzburg United at the Bidvest Stadium on Friday, February 1, at 20:00 in the Premier Soccer League. Defining the norm with women, disability and sport. The night would belong to TUT but Wits’ performances have earned them respect. The Wits Cricket Club were no match for top class Cape Cobras.